How to setup products in ClickBank? Login to your ClickBank account. Then, click on the “Account Settings” => “My Products”. By default, the “standard products” tab will be highlighted. This is for standard, 1 time purchases (not recurring products). Click on the green button (Add New Product) to add your new/first product. Enter the details of your products, e.g. product name, price, etc. Pay particular attention to the Thankyou Page. This URL should point to the easyClickmate thankyou URL, i.e. Then, click on the “green checkmark” to request product approval from ClickBank. Finally, you need to insert the actual download URL/page in the easyclickmate control panel. 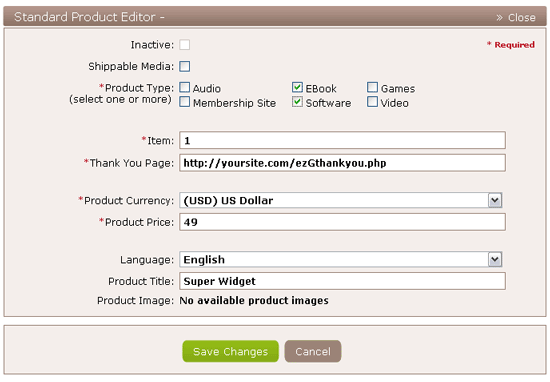 customer sales page Clickbank payment ezGthankyou.php your actual download page.